You know how last week I was really excited for the Thursday Night Football? Too bad the networks can’t flex the Jags-Browns game into the Thursday night slot, or even better yet, the Monday night New England-Kansas City rout bout. Over the summer I stumbled across a smoked cheddar and bacon version of pimento cheese from the Parlor Market in Jackson, Mississippi, so when the estimable Gurgling Cod again declared November to be Pimento Cheese Awareness Month, I couldn’t wait to take another stab at the dish after last year’s middling attempt, What Happens When A Yankee Makes Pimento Cheese, in support of this peculiar cause. 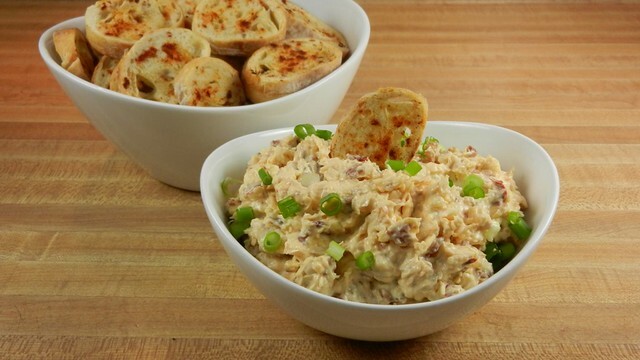 Let me tell you, after this recipe, we’re all pimento cheese converts around here. With crostini and celery during college football. On toasted white bread in mini-sandwiches served as a snack between Sunday morning football brunch and Sunday night football dinner. We loved it. Our guests loved it. Our neighbors loved it. It totally changed how we all thought about pimento cheese and is already on the menu for this weekend to put on burgers, like how Ally over at Copacetic in Carolina likes to serve her pimento cheese while tailgating all over SEC country. Smoky Bacon Chipotle Pimento Cheese will probably go down as the easiest and yet most satisfying of all the Football Foodie recipes all season. The smoky cheddar comes alive in the cream cheese and mayonnaise, the heat of the chipotle tempered by the sweet and salty bacon. Delight in a dish. The original recipe from Parlor Market called for twice as much mayonnaise, but I found you get a nicer, thicker pimento cheese using a smaller amount. If you want a thinner pimento cheese though, go for it and double the amount of mayo in your batch. 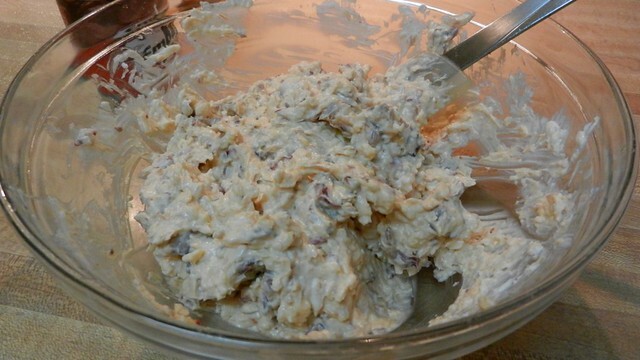 Southerners almost universally call Duke’s Mayonnaise in their pimento cheese recipes. They are right to do so, as it is a much better mayo (even above making your own). As I recently discovered, if you order from Duke’s directly, the shipping is free. $20 for 12 8-ounce bottles still works out to be cheaper than if I was buying mayonnaise at the store, so don’t feel like you’re splurging on an exotic ingredient if you need to order Duke’s because you live outside of their normal territory. 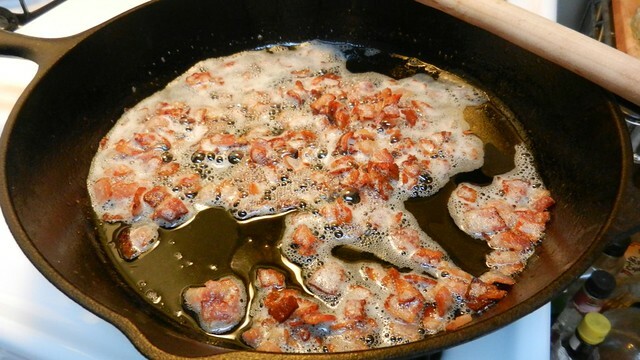 Chop and gently cook bacon until crispy. Drain and cool. 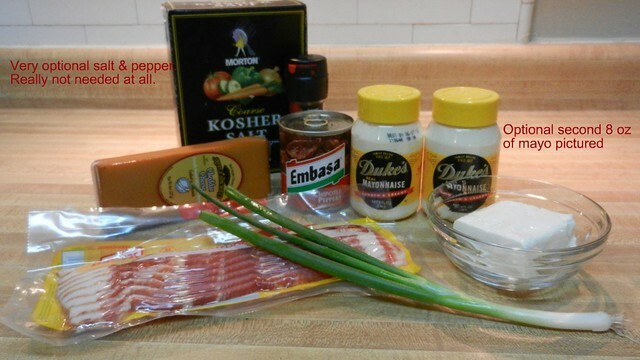 While the bacon is cooking, grate the cheese and combine with the softened cream cheese and mayonnaise. Once the bacon has cooled, fold in the bacon and then chopped chipotle peppers to taste. Add salt or pepper if desired. Top with the chopped scallions and serve with crostini, vegetables or even as a filling in a sandwich on toasted bread. Or on burgers. 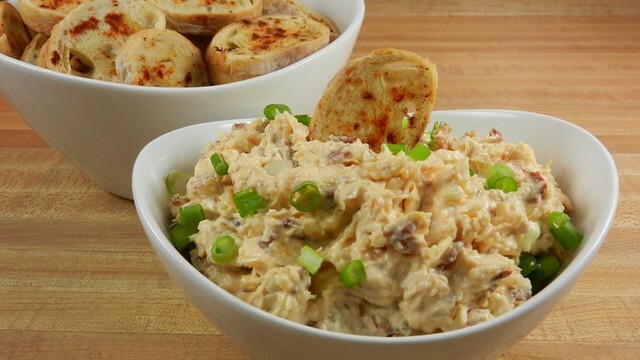 Smokey cheddar, spicy chipotle and meaty bacon converts everyone over to pimento cheese love. Salt or pepper if desired. Serve with crostini, vegetables or even as a filling in a sandwich on toasted bread. The original recipe from Parlor Market called for twice as much mayonnaise, but you get a nicer, thicker pimento cheese using a smaller amount. If you want a thinner pimento cheese though, go for it and double the amount of mayo in your batch. I highly recommend adding the green onion. I suggest taking some of the pimento cheese and spreading it on some good-quality bread (I used sourdough) and making a grilled cheese sandwich with it. I threw some deli-sliced turkey on there for extra protein but you could use tomatoes or whatever sandwich fillings you prefer. No matter what, you will enjoy a sandwich that is pure bliss. Nice. A few other people let me know they put it on sandwiches and burgers too. Another suggestion from someone on Twitter was to bake it and serve it hot. Might have to try that way next time I make it. Just had to stop over and tell you what a hit this was for us today. We hosted a little post-New Year’s football party this afternoon & I served this instead of my traditional jalapeno pimento cheese. I truly hate to admit this, but yours was a bigger hit. The guys especially couldn’t get enough of it. I served it with French rounds & pita chips. The next time I make this though, I’m taking Phil suggestion and making grilled sandwiches. Thanks again brilliant Lady. Good win for Steelers! Ever since I made this Bry has asked for it every weekend. I’m afraid we’d both be the size of a house (along with all of our friends) if I kept serving it.